Two months ago pizza takeaway giant Dominos released video that showed a typical delivery taking place, not by a deliveryman, but by a drone. The drone is controlled by a man, but this does beg the question of whether we will be seeing more and more of these drones entering the sky to replace the conventional four wheeled transport. We are yet to find out whether the video released by Dominos, is actually a real advancement in technology that they are going to implement in the future or just a marketing stunt. . The internet has changed our lives in such a way that a lot of what used to be our daily routines can be done in the comfort of our living room or even bedroom on a laptop. With more and more High Street shops closing as shopping on the internet becomes increasingly popular; there is still the issue of how the physical products can get to you. Obviously we can cope with deliveries being made by car, van or lorry, but judging by our past, we are very impatient creatures and often find ways of making things quicker and more efficient. 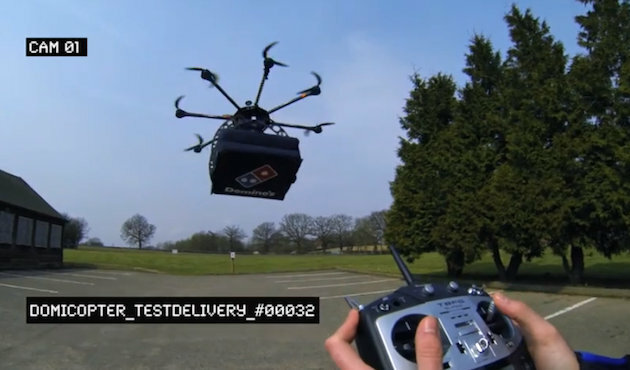 If Dominos new “Domicopter” is anything to go by, it looks like a glimpse into the future of deliveries. There are downsides to this form of delivery service though. The first and probably most obvious is damage. Looking at the Dominos video, you can see that the pizza is being carried below, but what if the pizza is dropped. Also it doesn’t look like the copter would put up much of a fight if it was to be intercepted. Obviously this works well for smaller items but what about larger items like office furniture? I am not sure I would be comfortable with a desk flying through the air towards my house or office! Maybe we will see more of these drones in the sky, but I am not sure whether this going to be the form of transport used in the near future.